When I was a teenager, my mom would take a pile of canvas bags into the grocery store. As she handed them to the baggers, (who usually gave her a funny look) I was embarrassed that she didn’t just take the plastic bags they had at the store. When I went to the grocery store, I conveniently “forgot” the armful of bags. “There’s a black hat caught in a high tree top,” goes a song by the Police. But is Sting so sure that’s a hat? Oh, wait, it’s a plastic grocery bag! I can’t tell you the number of times I’ve seen something scampering across the road only to realize it was just the wind blowing a plastic bag around and around. Due to the number of plastic bags floating around the neighborhood, much less my kitchen cabinet, I’m no longer embarrassed to bring my own pile of reusable bags when I go shopping. When I forget my reusable bags in the car or in my kitchen, I’m upset with myself. As I see other shopping carts with their shoppers’ reusable bags inside, I regret that I have to take more bags home with me! When I do remember my bags, baggers no longer look at me, wondering what do to with these bags I give them; they are much more used to people bringing along bags from home. Don’t these bags fill up the back of my van beautifully? But on the occasion that I have forgotten my bags, and do use plastic, here is a way to reuse those plastic bags. 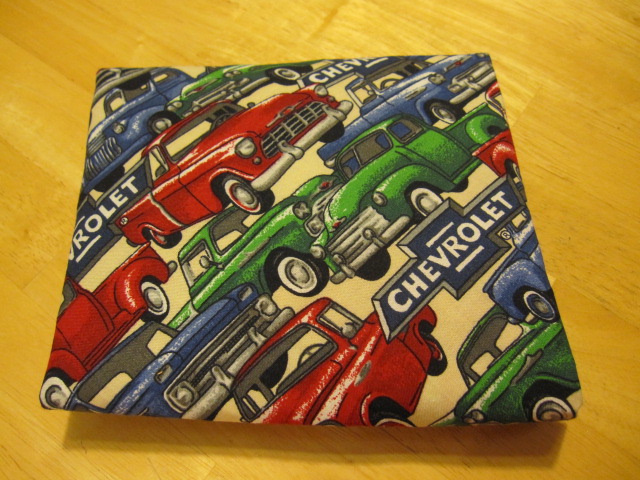 At our last MOPS meeting, we turned them into reusable sandwich wrappers! 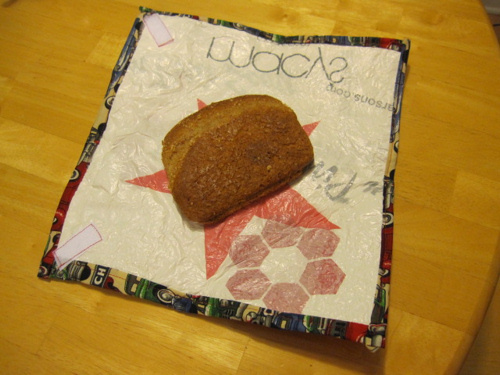 Here are the directions for the cloth and plastic sandwich wrappers we made. Although I have concerns about using plastic with foods, plastic bags seem to be safe, (see chemicals in plastics) especially if you use a Ziplock bag as the top layer of your sandwich wrapper. The simple swap from plastic bags to reusable bags is brought to you by Hyacynth from Undercover Mother and Robin from Diet Coke on the Rocks. I've never known anything but taking your own bag to the store. As a matter of fact, they started charging for bags a long time ago in the Netherlands, not much, but enough to make you remember to take your own next time. Apart from bags, we also use folding crates. The good thing about using your own bags: not only is it good for the environment, but the bags are usually a lot sturdier than those bags handed out at the supermarket! And of course they usually look a lot more fun!! Nice, Ginny! And I have to tell you– I just love the back story about your mother. Why did she do it? Did she realize the environmental impact or was it another reason? Thanks for linking and inspiring us! I love this idea!I think bringing canvas grocery bags actually makes me enjoy shopping more for some reason and lately I've been thinking I need to switch from plastic bag to reusable sandwich bags for my daughter's school lunches.Thanks for the inspiration! I try to keep several in my trunk so I can usually find a few in there. I love using them.